Cardboard, duct tape and plywood played vital roles in focusing the recently unveiled new prototype redesign for Golden Corral restaurants in Greensboro, North Carolina. Lance Trenary, the franchise’s President and Chief Executive Officer, told Modern Restaurant Management (MRM) magazine the story of how a mockup housed in a warehouse proved to be an invaluable time and cost saver for the project called Gateway. 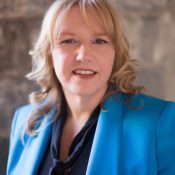 “We spent a day walking through it and we able to correct so many things that looked good on paper. But, when we saw them in cardboard and plywood, we knew they wouldn’t work in brick and mortar. It saved us thousands,” he said. Before they could get to that point, Golden Corral embarked on a nearly two-year long process to revitalize the design that included surveying franchisees and guests to learn what elements worked and what needed improvement. 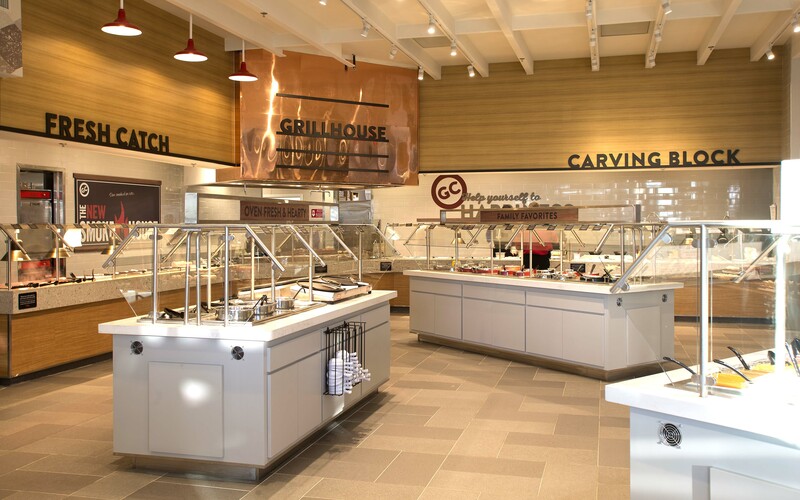 To complete the redesign effort, executives at the grill-buffet chain turned to two design firms: FRCH Design Worldwide and Profitality. The prototype incorporates a contemporary appearance for the interior and exterior of the building with improved layouts for the dining room, service bars and kitchen areas. The new restaurant seats about 400. FRCH created a new building design with an elevated curb appeal. Exterior elements include stacked stone towers, oversized windows for more natural light, red awnings and accent lighting. Inside, a focal point stone fireplace provides a homey feel and more than 1,000 square feet of dining space allows for increased room between tables. The open buffet areas evoke residential kitchens and highlight the chains made-from-scratch recipes. New bars focus on a new menu items including smoked ribs, chicken, brisket and turkey cooked in hickory-wood smokers. Other enhancements include replacing the self-serve beverage stations with servers delivering beverages to guests, new plates and upgraded silverware served at each table and new uniforms for team members. Profitality was tasked with creating a more efficient operating platform and based the kitchen redesign on time-motion studies and increased employee efficiency. This resulted in a reduction of the kitchen space of nearly 900 square feet that could be allocated for dining room use. Overall, the new facility design is anticipated to produce greater customer service and dining room cleanliness, as well as increased energy efficiency. The restaurant is operated by franchise owner Dave Gronewoller. 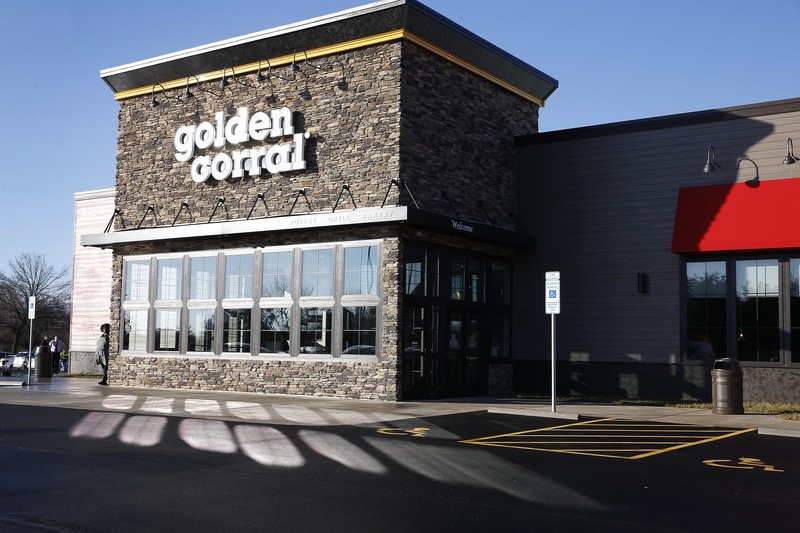 A second Gateway prototype will begin construction in Gainesville, Georgia this year and Golden Corral is incorporating the new prototype into two major reimages in Texas. They will study the Greensboro location to see what elements of the design works best and what can be adjusted in future versions.